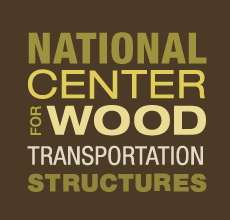 The NCWTS partners with three federal agencies and a university, each of which has an interest in wood transportation structures. The Forest Products Laboratory (FPL), the nation’s only federally funded wood utilization research laboratory, has a close partnership with Iowa State University that extends back more than 25 years, well before the founding of the NCWTS. The two entities combine extensive expertise in wood bridges and other wood transportation structures. Besides wood bridges, the FPL studies wood transportation structures such as noise barriers, marine facilities, retaining walls, and sign supports. The National Park Service utilizes a large number of wood bridges and transportation structures in its parks, because its guidelines favor natural materials such as timber and stone for such structures in national parks. The NCWTS has a growing partnership with the National Park Service aimed at helping them utilize the latest best practices in constructing and maintaining their timber bridges. With stewardship over all highways, bridges, and tunnels in the United States, the Federal Highway Administration (FHWA) also has an interest in wood bridges and transportation structures. Their partnership with the NCWTS was facilitated by the close relationship between the FPL and FHWA. The NCWTS is housed at the Institute for Transportation at Iowa State University (ISU). As a leading transportation research center, partnership with InTrans leads to program efficiency and leveraging of federal funding, thereby maximizing public benefits and minimizing costs.